In a never before initiative by the Film Critics Guild and Motion Content Group, Critics Choice Film Awards acknowledges and appreciates the best cinematic experiences across the nation. At an event in Mumbai on April 9, Zoya Akhtar and Vidya Balan (along with the members of the Film Critics Guild and the representatives of Motion Content Group) announced the nominations for the Critics Choice Awards. Apart from uplifting the best cinemas in Hindi, the awards also honour the brilliance of filmmaking in eight languages like Marathi, Gujarati, Tamil, Kannada, Malayalam, Bengali and Telugu. Hailing the credibility of the awards, Zoya Akhtar said that despite her debut film ‘Luck By Chance’ not faring well at the box office, she gained support from the critics who appreciated her efforts. Announcing the awards, Zoya Akhtar shared the nominations for the Best Production Design with the names of Rita Ghosh for ‘Manto’, Shubhrato Chakraborty and Amit Ray for ‘Padmaavat’, Nitin Zihani Choudhary and Rakesh Yadav for ‘Tummbad’. 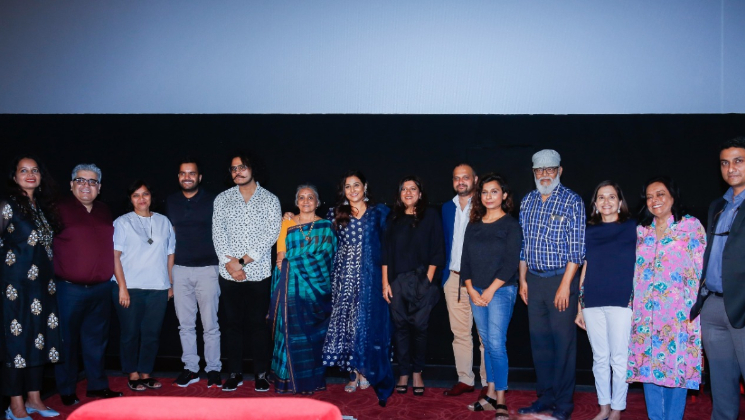 Moving towards the next category, Zoya Akhtar along with critic Raja Sen announced the names for Best Songs including ‘Aahista’ from ‘Laila Majnu’, ‘Bol Ke Lab Azad Hai’ from ‘Manto’, ‘Dilbaro’ from ‘Raazi’, ‘Halla’ from ‘Manmarziyaan’ and ‘Paintra’ from ‘Mukkabaaz’. For the Best Background Score, the nominations are Daniel B. Gorge for ‘Andhadhun’, Amit Trivedi for ‘Manmarziyaan’ and Zespa Kyd for ‘Tummbad’. Best Editing nominations included Pooja Ladha Surti for ‘AndhaDhun’, Nitin Baid for ‘Raazi’ and Sanyukta Kaza for ‘Tummbad’. For cinematographers, the awards nominated Avik Mukhopadhyay for ‘October’, Sudip Chatterjee for ‘Padmaavat’ and Pankaj Kumar for ‘Tumbbad’. The awards for Best Actor female won nominations to Alia Bhatt for ‘Raazi’, Anushka Sharma for ‘Pari’, Neena Gupta for ‘Badhaai Ho’, Taapsee Pannu for ‘Manmarziyaan’ and Tabu for ‘Andhadhun’. Male Best Actors included Ayushmann Khurrana for ‘Andhadhun’, Gajaraj Rao for ‘Badhaai Ho’, Ranbir Kapoor for ‘Sanju’, Ranveer Singh for ‘Padmaavat’, and Vineet Singh for ‘Mukkabaaz’. The most awaited and anticipated award nominations for the best film included ‘Andhadhun’, ‘Raazi’, ‘Badhaai Ho’, ‘October’ and ‘Tumbbad’. Including renowned film critics like Anupama Chopra, Rajeev Masand, Bhawana Somaaya, Raja Sen, Shubha Shetty, Bharathi Pradhan, Rohit Khilnani, Shubhra Gupta, Baradwaj Rangan, Suparna Sharma, Udita Jhunjhunwala, Suhani Singh and Rahul Desai, the Critics Guild is definitely in safe hands. The Film Critics Guild and Motion Content Group have joined hands once again to present the first-ever Critics Choice Film Awards, a pan-India awards body, which is the only title after the prestigious National Film awards to award filmmaking in eight major languages. The ceremony of Critics Choice Film Awards will take place on April 21.